I'm off to a workshop tomorrow that the school was kind enough to arrange for me and a math teacher. It is a difficult time to be out, but I am still looking forward to the change of scenery and chance to learn something new. Kurt has been out of town all week and has just gotten back in time for me to leave in the morning. It is a two hour drive, so it will be very early out for me. No quilting at all this week, alas. With Kurt gone it is always difficult to find time, but there have been evening things and I had to get a sitter last night to go to a meeting about the kids new school in the fall. I cut out most of the blocks for Tic Tac Toe last night while watching Free Willy with the kids. After that I laid out all four quadrants of Spinning Stars and made sure the colors were well distributed. I've got those carefully pinned and sitting next to the machine getting sewn together. In between the rows and columns, I've been working in these blocks and throwing them up on the design wall. They sure are bright! Ryan is at a football game with Kurt and the girls are wanting to go on an outing. I'm going to try to work a trip to Joann's into the mix so that I can pick up some of the solid colored flannel that is on sale right now. I've got two more sets of blocks ready that would like some nice cozy backing fabric. Cross another quilt off the list! I Spy a parrot is quilted and trimmed. 10 more school days for seniors (and they let us know about it). Much like pushing jello up a hill, we keep plugging away until the end. It was a busy week full of scouts and meetings and lots of miscellaneous evening stuff that limited my time to quilt. I did manage to get a few minutes in here and there though, and was almost done with the last border when I got home from school this afternoon. What I really ought to do is get some serious binding done. There are three quilts in the stack now. If I get it sewn on tonight, I can take it to Ice Skating tomorrow and do the handwork while watching the girls. Regular lessons are in the morning and then the Girl Scouts have a group skate in the afternoon. Separate sessions for the two age groups means I'll be spending at least 5 hours tomorrow watching skating. Something to do will be a definite requirement. I'm not sure what is next up on the frame. I've got two "good" quilts ready to go, but I'm not sure if I'm confident enough in my skills to risk messing up something I really like. Instead I might finish the border on Starlight, a wonky star quilt with words that is meant for donation. I've ordered a packet of pantographs from Golden Threads and am anxious to try out the laser pointer. Sydney was duly impressed with the new quilting machine and wanted to give it a try. Her attention span didn't last long, but she did put her own stitches into the quilt and was quite proud of herself. How cute is she missing 4 front teeth? She has an adorable little lisp right now that make me want to pick her up and give her lots of hugs. 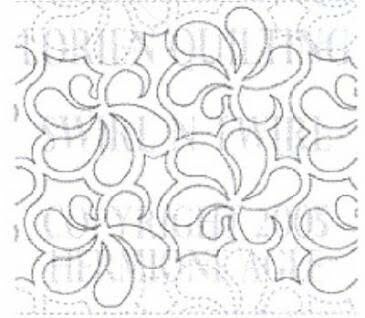 Bonnie at Quiltville has posted a quick and easy strip pattern that has struck my fancy. I think I'll do some cutting tonight and set them next to the machine to work their way through. Spinning stars blocks are next to be put together and I will need something to feed in between rows. Maybe I'll do a quick test block just to make sure first. Go and check it out -- it could be a little weekend quilt along project. 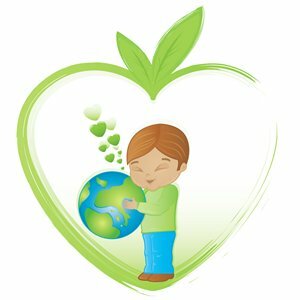 We celebrated earth day at school today by planting some seedling that we had been nurturing as part of a germination experiment. It felt good to be outside for a while. We are putting together a solar powered butterfly garden and trying to work it in across the curriculum. I think we will start doing some soil testing with the Chemistry students while the Anatomy kids learn about medicinal herbs. For now I think I'll finish my earth day festivities by "recycling" some fabric into quilts. How about you? I was surfing around last night looking for free motion quilting ideas when I saw this cute i-phone pillow at Dog Named Banjo. Robyn filled hers with random obscure grains from the pantry, but I thought about filling mine with crushed walnut shells. I've seen several pincushion tutorials that suggest using the lizard litter from pet stores. I remembered seeing a nifty pin cushion somewhere that was made of two squares but somehow turned into a cute little pyramid. So off I went to find a tutorial remembering only that I had seen it turned into a chicken on somebody's blog. I think the idea behind the i-phone pillow is the same concept, so I was motivated to find directions. Apparently The Domestic Goddess wrote instructions here. So in the 10 minutes of sewing time I had after my Girl Scout leader meeting tonight, I whipped up a little trial version. Now I've got 5 quarts of crushed walnut shells,and it looks like I'll be making pin cushions for a while. Does anybody have a cute pattern I should try? Last night was Cub Scouts, tonight was Girl Scouts, tomorrow is a girls night out for work, so my machine time is looking limited for a while. I did go into the quilting room for a few minutes though to sew another row on the I Spy quilt. It is awfully handy to have it sitting there and waiting patiently. I touched base with the Girl Scout leader who was my point of contact on the quilting project and apparently the shelter for women and children that her troop was helping to refurbish has yet to reopen. She is holding onto the quilts for me, but if that doesn't work out I'll have to find a new shelter in need of quilts. After pulling Whirly Giggles off, I got I Spy loaded on. The quilting motif is blades of grass which also looks a bit like a flame to me. I only got two rows done before dinnertime. One of these days I'm going to try a pantograph, but for now I'm having lots of fun with freehand designs. Somewhere I have a bag full of binding. I'm going to be needing some of that pretty soon. Sometimes I just have to laugh at how much my husband understands exactly how my mind works. He was taking the kids to a sand festival this morning and I was apologizing for not going along. 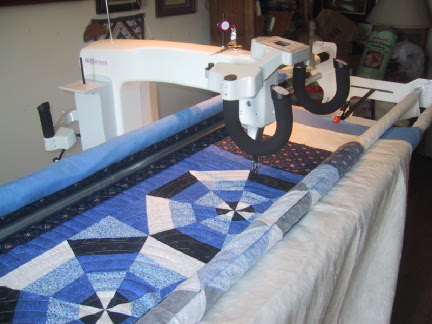 He told me there was no need to apologize, spending the weekend quilting was all part of making the new quilting machine into an event. So instead I continued the quilting machine marathon weekend with Whirly Giggles. This one is for my niece who wanted something soft to snuggle with. I put flannel on the back, which was a little stretchy on the frame, but is so soft and cozy. I debated doing some feathers allover, but chickened out and went with a basic meander in the background and some simple arcs in the foreground. At some point I'll need to think about catching up on the binding, but for now I think I'll load up I Spy a Parrot. I did manage to drag myself out of the house last night for an outing to see a play. I girlfriend of mine called to invite Anna and I to go with her and her daughter. The whole family ended up coming along. It was the Pajama Game, which a silly and enjoyable musical. It didn't really take me all day to do the quilting on 4 square. It just took all day between the normal Saturday things. Get up and check on quilt, get girls off to ice skating. Quilt a line and check on Ryan. Back to the quilt and give the dog her medicine. Do a little cleaning and rearrange some furniture while discussing where to put the craft desk. Wind a new bobbin and watch the kids swim. Eat some lunch and change the laundry before finishing the quilt off. Does anyone else have those days? As much as I say I am going to devote a whole day to quilting, it is really only a few hours interspersed with the stuff of life. I'm not sure whether to load on another quilt or go ahead and finish putting the study back together. I'm thinking another quilt might win --- maybe just a small one. I loaded an actual quilt onto the HQ 16. I'm going to quilt it in a double bubble pattern that I have also seen as olives. Eventually I'm going to have to sleep, but I'm having lots of fun at the moment and don't want to stop. I've got dark colored thread in the bobbin to match the back, and I think the tension looks good on the front, but I'm afraid to peek at the back. Everything seems to be working just the way it should. I've quilted a sampler of random patterns. Now I'm thinking of loading on an actual quilt. I have a very limited thread selection so far, so I'll have to choose carefully. My stitches seemed too loose. When checking the back, I had serious eyelash issues. Eyelashes on the back are clearly due to inadequate top tension. I must have watched the "how to thread your machine" video at least five times knowing that I must have been missing something. Somehow along the way I got off on a bobbin tangent. Thinking that less bobbin tension could make up for too little top tension. Big mistake. Messing with the bobbin led to tangles and bird's nests and my own little version of swearing. Admonishing myself, as I would my students, to use proper scientific method, I spent the afternoon working through one hypothesis at a time. I narrowed it down to the little screw knob, knowing the secret was there somewhere. Tightening all the way didn't seem to be changing the tension at all. Finally, I was within an inch of the end of my practice fabric and almost ready to call the toll free number for help, when the thread finally found its way in between the tension discs. Magically, as if it hadn't been mocking me for the past four hours, my machine started making beautiful, perfectly balanced stitches. Now I'm off to make a new sandwich and make something a little prettier. Happy weekend everyone. With fanfare much like that associated with babies first steps, I have taken my first stitches on the new HQ 16! Much like those first baby steps, perfection has yet to be achieved. The tensioning wasn't quite right. It would look good for about 12 inches and then get very loose before self correcting. I'm sure it has something to do with the way I threaded the needle or loaded the bobbin. I'll watch the tutorial again and fiddle with it a bit. It is amazing how quickly the stitches fill the top. It only took a few minutes to fill the exposed fabric area. As soon as I get the tension issue fixed I'll try using the laser to follow a pantograph. I went to Anna's music performance at school this morning and then went to pick Lizzie up from the vet, she got fixed and she is none to happy with me right now. I've still got a few more hours before I have to pick up the kids. Maybe I will load a preprinted panel on next. Soon I need to start reassembling the house. It's all full of boxes and displace furniture right now. I still have to figure out exactly where everything is going to live and get it all settled in again. Maybe I can worry about that later though, right now I have quilting to do. The web site said my packages were loaded for delivery at 6:47 this morning. I left a lovely note for the UPS man describing which neighbor could sign if a signature was required and when they would be home. Then I found odd moments between classes to call the neighbors to see if any deliveries had come. Finally by 2 I brought the rest of my work home with me and there they were, 7 cardboard boxes of various shapes and sizes! Most of the afternoon was spent carefully unpacking each box, checking for instructions and watching instructional DVDs. The table came first, it took three boxes. Try as I might, I could not find any screws to hold it all together. Although I was sure I could call and get more, I didn't want to wait, so off to Ace Hardware I went on the way to get the kids. They are always so ridiculously nice there. A nice older gentleman greeted me at the door, walked back with me and helped me find exactly the right size of screw. I paid $2.64 for a box of 100 and went home to happily do minor construction. Kurt arrived in the midst of all of this on the way to a business dinner and began grumbling about the $600 dollar table that didn't even come with screws. He could accept the cost of the machine and frame, but somehow the additional cost of the table was ready to send him over the edge. I ignored him blissfully and continued on my way. Without instructions I wasn't sure about the finishing touches, and so called up Handiquilter and explained my dilemma. Instructions were in my e-mail within minutes, and Whitney promised to send a new hardware package containing the screws, some locking mechanisms and wooden dowels. I had started to set the frame up and put together the rails when dinnertime hit. Tonight was a fundraiser night at Chick-fil-A for the kids school. Most of the teachers and administrators were there as well as what seemed like hundreds kids. They are always so nice there, and I think they had extra staff on hand for the special event. We came home with all sorts of stuffed cows and balloons. Anna helped me with the boxes and managed to find the mysterious missing screws! I'm so anxious to be sewing something, but the interim has just ended and grades are due at 8 in the morning. I finished the last of the grading last night, but I've still got to put the last little bit into the computer and make comments for each student. I'm taking a personal day to see Anna's music performance at school and take Lizzie to the vet to be fixed. That means I can stay up until the wee hours and try to get everything up and going. Now, back to work so I won't feel guilty about finding time to play. Grades are due Friday at 8 a.m. for the last interim. I'm trying hard to get it all finished up now in case I am busy or distracted tomorrow. 5 quilts ready to go. Backings are pieced and they are all waiting together patiently. I've got one more that needs borders and then I'll move onto some easy panels that can be my starter practice pieces. Next on the agenda: moving around some furniture to make some room. I guess it is no secret that borders are not my favorite thing. I love the look of them, and truly appreciate how much they can add to a quilt. I just get so anxious at the end and I like to get things done. The I Spy quilt though is just a tad too small. I had pulled this parrot fabric out of the donation stack for the back, but I'm thinking the green might work well as a border option. I guess I'd better start the pressing, measuring and pinning. This quilt was kind of a random selection of blocks, but I'm starting to like it now that it is all coming together. I always seems to work out that way, doesn't it? Decided to make do for the sashing strips on the I Spy quilt. I had a bundle of fat quarters in graduated shades of green. I had been saving it for something special. I've decided not to save for something special because a finished project is special enough for anyone. So it is all laid it out, stacked it up and pinned it --all ready for sewing together. Happy Sunday morning. I just finished putting the blocks together for Four Square. I think I'll save the ironing for tonight whilst watching some TV. I got the extra I spy squares cut out last night as well, so I could get that one put together, except that I don't have enough of any particular green for the sashing strips. I could mix in some more sashing fabric or just set it aside until I can get to the fabric store -- not sure which I'll do yet. I've been twice this week already which gives you some idea of the sorry state of my stash. I always have enough to start a quilt, but never enough to finish it. Sydney and I went into school this morning to help out with a solar garden that the students are putting in. That led into a birthday party this afternoon. The rest of the gang just got back from the big OM competition, so they are all tired and grumpy. Maybe they will all have an early night so that I can get some more blocks sewn together? I have a set of 6 inch "I Spy" blocks that were hanging out in the orphan block stack. There are 15 sets of 4 that have already been sewn together. I pulled a green for sashing and a yellow for the corner stones. Using the Sock Monkey Quilt as my yardstick for a twin size donation quilt, it looks like it could use one more row to bring it to the right size. I'm all out of lime green, so I guess I need some more of that too. I probably have 20 fabrics somewhere that could work in the I spy theme, but I'm not sure if I want to pull and cut right now. Maybe I'll save that part for tomorrow. One of my coworkers has a wife that underwent a surgery for breast cancer yesterday. She is facing a grueling round of chemotherapy now. I've never met her, but I still thought it might be nice to make her a quilt. It would be a way to show support for my fellow teacher if nothing else. Also, making a quilt has become my first impulse for most situations. Baby, illness, service project -- sounds like you need a quilt for that. I pulled these four possible color combinations. I go back now to my familiar complaint about making quilts for other people: it is really hard to guess what someone else will like. Anyone else have a vote? Starting in the upper right hand corner and going around clockwise; option 1 is a blue floral stripe, option 2 is a pale pink sage and teal paisley that looks like owls to me, option 3 is a pink and yellow floral paisley with a coordinating stripe, option 4 is pink and purple coordinated line of florals, butterflies and stripes. I'm thinking of doing a simple star block with an alternating Irish Chain block similar to Twilight. I just finished the blocks for Four Square! There are 40 each of the 16 patches and the white sashed four patches. Just enough for a twin sized top. They aren't all ironed yet, but I have to put together a test for Chemistry tomorrow. After school I am going to make a quick trip to Joann's for some more backing fabric and then lock Lizzie in the kitchen so that I can have a little layout party. Lizzie has developed the really bad habit of peeing on quilt blocks laid out on the floor. The floor is my favorite spot to lay out quilts, so we are going to have to come to some sort of arrangement. Unfortunately I can't keep her in the kitchen and still leave the sliders to the pool deck open. The weather is at that perfect spot right now when the doors and windows can stay open because it hasn't gotten so hot the air has to be on all the time. I've got finished blocks for five quilts ready to go, I'll see how many of them I can get to the finished flimsy stage this weekend. Kurt will have the older kids at OM, but I'll have Sydney for ice skating, then there is a gardening thing at school and a birthday party in the afternoon. Other than that, it should be a nice peaceful weekend though :>. I just finished the second quadrant of Four Square. It would be nice to get more done at one time, but there just doesn't seem to be that much time in the evenings by the time dinner, dishes, baths, stories and bedtime are all taken care of. The weather has finally been nice enough that we are taking evening walks or having swims after dinner. We are reading Alice in Wonderland with Anna and Sydney has a Dr. Seuss contest with her class, so it takes both of us right now to get all of that taken care of. I got the fabric from last night washed and dried, so if sitting down in front of the computer doesn't take my last bit of energy I might get some of that ironed before my own bedtime routine. Interims end next week, so I'm trying to get caught up on all of my grading at work. I made a tidy stack on the corner of my desk before spring break and let it sit there patiently waiting for me to get back to it. Eventually people want scores and updated grades though so I'm diligently working my way trough it all and making sure it is duly entered into the computerized grade book. I seemed to be out of a lot of the fabrics to go with the blocks I had already made. I couldn't finish Spinning Stars, because I needed a green to sash it with. I wanted to use red to alternate in Four Square, but didn't have any. 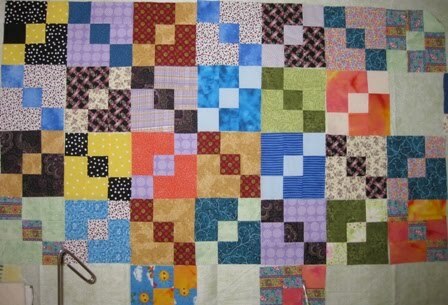 I am ready to finish of several quilts that will need backing fabric, and there is not a scrap of batting in the house. You get the general idea, right? A trip to the fabric store was definitely in order. The kids and husband were all busy with thier last OM practice before the big state competition this weekend, so I took advantage of the open time, grabbed my 40% off coupon and headed out. I got a call from Karen at Handiquilter today and she says that my HQ 16 will be on the truck Thursday and will take about one week to ship. Just one weekend to get everything ready! Kurt and I looked at the sewing room/guest bedroom/study this weekend and figured out a game plan. Now I just need to do a bit or arranging and make space for everything. Then I will line up the tops and start getting them ready for the big day. Amy is getting her new system tomorrow -- so I'll have to see how she handles everything to find out what I should be doing. The first day back after a break is never easy, so I tried to ease everyone in today with some simple labs. Just 5 weeks until seniors are done, and then one more week for the underclassmen before exams -- not that anyone is counting down. The last of the spinning stars blocks are done and ironed. Since I don't have enough of any single green to make the sashing, I switched over to these leader and ender four patches. I've seen something similar to this pattern several places, I think most recently over and Candace's blog. It uses sixteen patches and four patches surrounded with white. I thought it would be cool to try red around the single four patches, but I didn't have any, so white it is. I've got a huge shoe box full of squares, so maybe if this one turns out well I'll do the next one with red. I'm making this the same size that I use for the Girl Scout Happy Blocks, so it can be a charity quilt and go with those when it is done. It is, of course, designed to be a practice piece for the new HQ 16 which is supposed to be here on April 20th (not that anyone is counting of course). There was an e-mail in my inbox today announcing that Jennifer Chaiverini has a new book out. You can read the first chapter on the Elm Creek Quilts web site. She usually has a book released during spring break every year, and I looked for it, hoping to have something to read during the vacation. Maybe I can get it over the weekend when the rest of the group is off to the big OM state competition. I hope everyone had a great first day back after the Easter holiday. Happy quilting to all. Sorry for the bad pun, they are very popular around our house right now. We all had a great time at the Easter party last night; chatting, and playing games and finding confetti filled eggs to smash on the heads of unsuspecting observers. Our family won the big prize for the games, which were these matching bunny ears. We also took home a family pack of chocolate bunnies which the kids all ate for breakfast this morning. I have been picking bits of confetti and Easter grass up all day, but it was all well worth it. The kids look forward to it every year. I didn't accomplish any major projects over spring break. Unlike last year when I made the Welcome quilt from start to finish. I did take care of a lot of loose ends though. I spent an entire day washing, ironing and folding fabric to put away, and another cutting strips and squares from the leftover basket. I also got the rest of the blocks done for the main part of Spinning Stars, as well as planning out the setting and borders. There are going to be four quadrants with 25 blocks each, separated and surrounded by a stripe of dark green. That should cover the top of our bed exactly. The part hanging over the side of the bed will be made up of two rows of four patches, or maybe three depending on how the size works out. Kurt has requested a thicker batting to keep us toasty during those harsh Florida winters. We have a couple of quilts that fit our bed, but they all fairly light weight. I don't feel ready to go back to school tomorrow, but it is getting very close to the end now. Summer is an even more exciting concept now that my HQ 16 is on the way. I'm already lining up the projects. I hope everyone else had a great holiday. 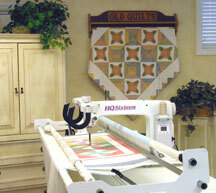 I'm not sure if I mentioned that I had been considering the purchase of a midarm quilting machine. I pondered for a while and then put it out there so my husband could dwell on it a while as well. He had a little initial sticker shock, but eventually came around to my way of thinking. He was stuck on the math of how many quilts you would have to pay someone else to finish before making up the cost of getting a machine to do it yourself. I think he eventually came to understand that I would rather be able to do my own than ship my tops off to strangers. After much mental fermentation and consideration, I finally went into my local quilt shop this morning and ordered a handiquilter 16 with stitch regulator, pro frame and an adjustable table. It should be here in two to three weeks, so no pictures yet, for now I've stolen these from google images. This has, of course set off a frenzy of organizing, planning and trying to finish things off. I've got a couple of "good" tops that I wouldn't want to risk messing up, so my short term goal is to come up with some practice tops that I wouldn't cry over if things didn't look too wonderful at first. My plan is to start with a plain fabric sandwich before switching to a couple of preprinted panel quilts and then onto utility scrap quilts before loading on things that I care about. I am pulling things out now to match up tops and backs and starting a list of things that I need (I am completely out of batting!) Add to that the reorganization of the furniture in the guest bedroom to make room for the new machine and I guess it is a good thing that shipping takes a couple of weeks. We are headed to an Easter Party this afternoon, but other than that, it is a nice quiet weekend at home. Kurt did get his new car on Wednesday, I have yet to ride in it, but the kids think it is pretty nice. While we were out shopping there was an incident with our neighbors son and another neighbor's dog. We pulled into the driveway just as all the fire tucks and police cars were leaving and right before animal control showed up. He is home from the hospital now and seems to be doing well, but it does make you think about how quickly accidents can happen. Sydney would have been out playing with him if we had been home and it could have just as easily been her in emergency surgery getting sewn back together. There is a big controversy now as to whether or not the dog should be allowed to come home again. I hope it doesn't all end up in a nasty law suit.